The Witchwood Crown is the latest entry in Tad William’s new high fantasy book series, The Last King of Osten Ard. It marks his return to the world he created for his first series, Memory, Sorrow, and Thorn, after 30 years away. 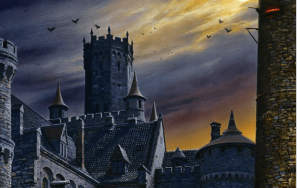 Kyle Willoughby and Claire White have been reading everything thing they can from the continent of Osten Ard, and they’re ready to talk about this influential author and his significance to the genre. Kyle begins by attempting to frame Memory, Sorrow, and Thorn‘s place in modern high fantasy and the bridge that it creates between the works of J.R.R. Tolkien and contemporary authors like George R.R. Martin. Claire take this further as she explains what led Williams to write his first series, and the challenges he faced returning to his characters with so much time passed in their life and his. Our hosts conclude by discussing their thoughts on the original books and what it feels like to be back.